LONDON, England (CNN) -- If Rafael Benitez is a man who remembers his life by decades, it's likely he views the current decade as his greatest so far. 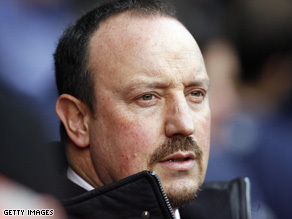 Liverpool manager, Rafael Benitez has taken his team to glory over the past five years. The Madrid-born manager of English Premier League giants Liverpool turns 50 next April, and in the preceding ten years he has coached sides to two La Liga titles, the UEFA Cup, the UEFA Champions League, the European Super Cup and an FA Cup. Still, "Rafa" (as he is fondly called by many Liverpool fans) enjoyed plenty of success before his latest roles. Growing up in the Spanish capital, Benitez played football for the Real Madrid academy, where he was a promising midfielder. He eventually went on to play for several lower-league teams in Spain and also briefly represented his country in the Spanish Universities XI. It was injury, however, that cut short his hopes of becoming a major success as a player, and Benitez moved into management at the tender age of 26 -- returning to Real Madrid to take over youth coaching roles. Benitez soon rose through the ranks and by 1995 had worked as assistant manager for Real Madrid's senior side and also coached the club's second team. Following stints of varied success at Real Valladolid, Osasuna, Extremadura and Tenerife, Benitez took on his first major appointment in 2001 with Spanish side Valencia -- where he gained an international reputation. At Valencia he claimed two La Liga titles and he also lifted them to their first UEFA Cup title win. Despite these successes, Rafa left Valencia for Liverpool in 2004 following a fall-out with his club's buying policy -- when he famously said: "I asked for a table and they bought me a lampshade." At Liverpool he brought immediate success. Although unable to bring the consistency required to compete for the Premier League title, he helped the Mersey-siders to the UEFA Champions League with a thrilling victory over Italian side AC Milan in the final. Since then, Rafa has taken Liverpool to FA Cup glory and another Champions League final. Although the last two seasons have gone without glory, earlier this year he signed a new contract that will keep him at Anfield until 2014, so his future appears secure. Outside of the Liverpool club, Rafa, who is married with two daughters, has become a well-known personality in the English and European football scene, and renowned for not shying away from a challenge. Benitez and former Chelsea manager Jose Mourinho were widely known to not get along, while more recently he has had an ongoing battle with Alex Ferguson in the media -- including an event that has become colloquially known as "Rafa's rant" -- where he launched a premeditated verbal attack about Ferguson in a press conference. The Spaniard has attracted criticism even from within his own club this season, as it appears his efforts to secure a Premier League title for Liverpool will fall short. But, at just 49 and only in his fifth season at Anfield, Benitez still has plenty of time to match the achievements of greats like Alex Ferguson. When Ferguson turned 49, it was 1990 and he was in his fourth season with the Red Devils. At that point the Manchester United manager was trophy-less with the club, and according to various media reports at the time came close to being sacked. Ferguson was saved by winning the FA Cup at the end of that season, and of course, we now know that 20 years later he has grown into one of the most successful club managers ever. So, given that Benitez has already picked up a Champions League and FA Cup and run at least a close second in the Premier League with Liverpool -- perhaps it should be left for 20 years before his results can be fairly compared to his contemporary rival. Who knows what "Rafa" may achieve by the time he reaches Ferguson's age?